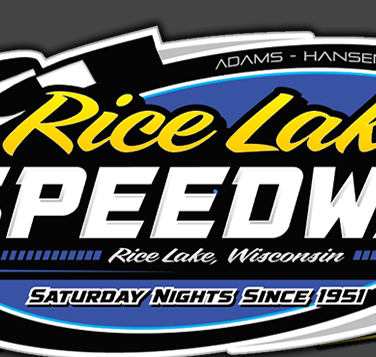 Rice Lake WI, April 30 – Nick Oreskovich came from the fifth row to power into the lead following a mid race yellow flag and from there he drove on to his first ever career win to highlight the racing action Saturday night at the Rice Lake Speedway. Kevin Bogdanovic scored an exciting win that saw three cars within a car length as they flashed across the finish line while also winning feature races in not quite som dramatic style were Michael Truscott, Matt Leer and Jason Havel. 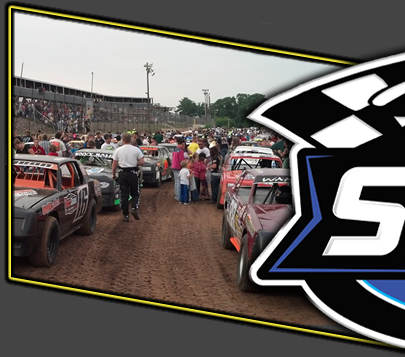 It was a bone chilling night for racing in northern Wisconsin but a hearty crowd was on hand to see the biggest field of cars yet this season as ninety five racers from three states signed in to race Saturday. Twenty one of them took Shaun Cimfl's green flag for the Super Stock main with rookie driver Adam Soltis taking the early lead. Soltis was challenged first by Terran Spacek and then Jeff Klopstein Jr. for the top spot while Curt Myers and Oreskovich led the pack of those charging to the front. Klopstein Jr. took over the lead as he swept around Soltis but Myers was a man on a mission as he passed Soltis and then challenged Klopstein Jr. for the lead. Oreskovich was also on the move as he too used the high groove to pass Eric Olson and Simon Wahlstrom and move into fourth and then challenged Soltis for third. Myers made several attempts to move past Klopstein Jr. but each time he was repelled. The race was one lap short of its midpoint when the first yellow flew for a spin. On the green, Myers got a great run on the outside and swept past Klopstein Jr. on the high side to take over the lead, only to pull up lame in turn four with a powerless car. The yellow waved again, Klopstein Jr. was restored to the lead and Myers was done. Oreskovich used the same move as Myers on the green and he made it stick too as he drove past Klopstein Jr. to take over the lead. Oreskovich then pulled away from the field as the remainder of he race stayed under the green. Klopstein Jr. was alone in second and the real battle was for third as Wahlstrom, Soltis, Olson, the Spacek duo of Randy and Terran and Aaron Wilson all battled for position. Oreskovich rolled on and was unchallenged the last few laps as he earned his first ever at this track. He will remain the Super Stock point leader, even though he will vacate that position when northern tracks open in the coming weeks. Klopstein Jr. finished a fine second while Soltis recorded his best finish in the Supers. Olson made a nice charge to end up fourth ahead of another rookie in Wahlstrom. The Street Stock feature saw the smallest field of cars but that didn't keep it from being a wild event with more than its share of yellow flags and a thrilling finish. Cooper Berlin and C.J. Wagner battled for the lead on the opening lap of the feature race but two yellows in the first three laps for spins shuffled the field early and often. Bogdanovic came up from the second row, dove to the low groove and found himself in the lead. Soon he was challenged by Jimmy Randall, running the higher side of the track as he likes to do. Several times he pulled up beside Bogdanovic but just couldn't quite pull off the move to take the lead. Yellows for spins and stalls kept the race from gaining much momentum but each time racing resumed, the same scenario took place as Bogdanovic remained glued to the bottom and Randall tried to drive around him. After Ashley Wahlstrom hit the front stretch wall and triggered another yellow, the call from the officials was to shorten the race by five laps which set up a green, white and checkered finish. Again on the green, Bogdanovic continued to lead with Randall providing a renewed challenge for the lead. However, this time they were joined by Cody Kummer who was riding the bumper of Bogdanovic. The leaders hit the final corner side by side as Randall tried to drive by on the high side and as they flashed across the finish line, Bogdanovic finished up a half car length in front of Randall with Kummer another half length behind. Sam Fankhauser and Ryan Glembin completed the top five. The Midwest Modified feature was a real tight one for the first half of the event until Truscott found a fast line around the track and was able to pull away. The first seven laps were frenetic as Bryce Johnson and Paul Suzik ran side by side for the lead with Tyler Vernon and Truscott right behind them. The traffic was very tight as the top eight cars pulled away from the field and were running in a close pack. Suzik was able to edge into the lead and Truscott passed first Vernon and then Johnson to move into second when the yellow waved for the sole slowdown of the race. On the green, Truscott got a good run on the high side and was able to slip past Suzik and take over the lead. Once in front, he gradually pulled away from the field and developed a comfortable lead. Vernon pulled in to challenge Suzik for second and after a brief battle, Vernon was able to take over the position. But the driver on the move was Ryan Viltz. Mired in the eighth position at the halfway point, on the lone restart Viltz jumped to the high side of the track and made that line work. With the majority of the field racing lower on the track, Viltz started picking off car after car as the laps ran down. He swept past Curt Myers, Deven Van House and Joe Chaplin Jr. and continued to charge. While Truscott rode home unchallenged for the win, Viltz pulled up beside Vernon on the last lap and in a photo finish, nipped Vernon for second at the line. Chaplin Jr. came home fourth with Shane Halopka completing the top five. The Modified feature got off to a slow start when Kevin Adams spun in turn one and collected a couple of cars. After sorting out that event, the race resumed with Matt Leer edging out ahead of Neil Balduc for the lead. Balduc was running close and putting the pressure on the leader while Cory Mahder moved up into third. Leer started to pull away with the top five runners spreading themselves out. Gradually, Mahder started to close in on Balduc with Kevin Eder also starting to bunch up behind the leader. Leer continued to roll and he had no problems as the rest of the race ran green, he had no challengers and he took a relatively easy win. Balduc fought off the late challenges of Mahder and Eder to finish second with Ashley Anderson completing the top five. The biggest field of Pure Stocks of the season was on hand Saturday, and despite that plus the fact that he was handicapped to the ninth starting position, Jason Havel still rode home with his third straight feature win in the division. Krysta Doughty took the early lead over a challenging Brent Miller and Joel Hinrichs while Havel was on the move quickly to race into a challenging position. There were three yellow flags before two laps could be completed as there was considerable shuffling of positions due to the slow downs. Doughty continued to lead but following the third restart, Havel was able to get a run on her and slip past into the lead. Hinrichs continued to challenge for the second spot while behind them the spins and collisions continued to break out as he proved hard to get more than a lap or two put together before the yellow would once again fly. Finally, a green, white and checkered finish was called for. Havel pulled away from the pack once again and drove home unchallenged for his third straight here this year. Doughty had a stiff challenge from Hinrichs at the end but she held on for second as he debut here this year was a successful one. Hinrichs finished a very close third and Andy Ladd also had a sterling run for fourth. Randy Graham moved to the front, spun and then worked his way back up to a top five finish. Following the race, the shocks of the winner and third place Hinrichs were claimed and they accepted the claim so the official finish was unchanged. 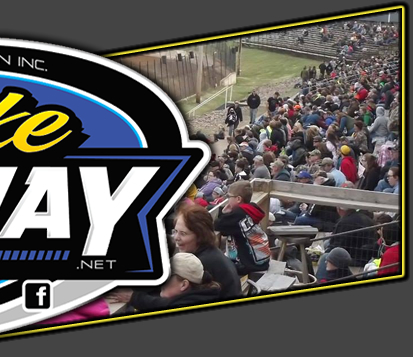 Saturday night racing now moves into the month of May with four shows scheduled and warmer weather promised. Regular five division programs dominate the next three Saturday nights while the first special event of the season comes on May 28th when the UMSS(Upper Midwest Sprint Series) comes to town with both winged and traditional nonwinged Sprint Cars joining the regular five class program. As always, warmups start at 6:30 p.m with racing to follow directly. Heat 3 – Hinrichs, Doughty, Grabon, Smith, Holmstrom Jr.